Lightning is a violent and sudden electrostatic discharge where two electrically charged regions in the atmosphere temporarily equalize themselves, usually during a thunderstorm. Lightning creates a wide range of electromagnetic radiations from the very hot plasma created by the electron flow, including visible light in the form of black-body radiation. Thunder is the sound formed by the shock wave formed as gaseous molecules experience a rapid pressure increase. The three main kinds of lightning are: created either inside one thundercloud, or between two clouds, or between a cloud and the ground. The 15 recognized observational variants include "heat lightning", which is seen but not heard, dry lightning, which causes many forest fires, and ball lightning, which is rarely observed scientifically. Humans have deified lightning for millennia, and lightning inspired expressions like "Bolt from the blue", "Lightning never strikes twice", and "blitzkrieg" are common. In some languages, "Love at first sight" translates literally as "lightning strike". The details of the charging process are still being studied by scientists, but there is general agreement on some of the basic concepts of thunderstorm electrification. The main charging area in a thunderstorm occurs in the central part of the storm where air is moving upward rapidly (updraft) and temperatures range from −15 to −25 °C (5 to −13 °F), see figure to the right. 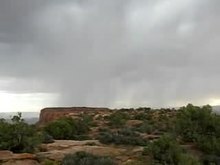 At that place, the combination of temperature and rapid upward air movement produces a mixture of super-cooled cloud droplets (small water droplets below freezing), small ice crystals, and graupel (soft hail). The updraft carries the super-cooled cloud droplets and very small ice crystals upward. At the same time, the graupel, which is considerably larger and denser, tends to fall or be suspended in the rising air. When the rising ice crystals collide with graupel, the ice crystals become positively charged and the graupel becomes negatively charged. The differences in the movement of the precipitation cause collisions to occur. When the rising ice crystals collide with graupel, the ice crystals become positively charged and the graupel becomes negatively charged. See figure to the left. The updraft carries the positively charged ice crystals upward toward the top of the storm cloud. The larger and denser graupel is either suspended in the middle of the thunderstorm cloud or falls toward the lower part of the storm. The upper part of the thunderstorm cloud becomes positively charged while the middle to lower part of the thunderstorm cloud becomes negatively charged. The result is that the upper part of the thunderstorm cloud becomes positively charged while the middle to lower part of the thunderstorm cloud becomes negatively charged. A typical cloud-to-ground lightning flash culminates in the formation of an electrically conducting plasma channel through the air in excess of 5 km (3.1 mi) tall, from within the cloud to the ground's surface. The actual discharge is the final stage of a very complex process. At its peak, a typical thunderstorm produces three or more strikes to the Earth per minute. Lightning primarily occurs when warm air is mixed with colder air masses, resulting in atmospheric disturbances necessary for polarizing the atmosphere. However, it can also occur during dust storms, forest fires, tornadoes, volcanic eruptions, and even in the cold of winter, where the lightning is known as thundersnow. Hurricanes typically generate some lightning, mainly in the rainbands as much as 160 km (99 mi) from the center. On Earth, the lightning frequency is approximately 44 (± 5) times per second, or nearly 1.4 billion flashes per year and the average duration is 0.2 seconds made up from a number of much shorter flashes (strokes) of around 60 to 70 microseconds. Many factors affect the frequency, distribution, strength and physical properties of a typical lightning flash in a particular region of the world. These factors include ground elevation, latitude, prevailing wind currents, relative humidity, proximity to warm and cold bodies of water, etc. To a certain degree, the ratio between IC (in-cloud or intracloud), CC (cloud-to-cloud) and CG (cloud-to-ground) lightning may also vary by season in middle latitudes. Because human beings are terrestrial and most of their possessions are on the Earth where lightning can damage or destroy them, CG lightning is the most studied and best understood of the three types, even though IC and CC are more common types of lightning. Lightning's relative unpredictability limits a complete explanation of how or why it occurs, even after hundreds of years of scientific investigation. About 70% of lightning occurs over land in the tropics where atmospheric convection is the greatest. This occurs from both the mixture of warmer and colder air masses, as well as differences in moisture concentrations, and it generally happens at the boundaries between them. The flow of warm ocean currents past drier land masses, such as the Gulf Stream, partially explains the elevated frequency of lightning in the Southeast United States. Because the influence of small or absent land masses in the vast stretches of the world's oceans limits the differences between these variants in the atmosphere, lightning is notably less frequent there than over larger landforms. The North and South Poles are limited in their coverage of thunderstorms and therefore result in areas with the least amount of lightning. Lightning is usually produced by cumulonimbus clouds, which have bases that are typically 1–2 km (0.6–1.25 miles) above the ground and tops up to 15 km (9.3 mi) in height. Lightning hotspots: The place on Earth where lightning occurs most often is near the small village of Kifuka in the mountains of the eastern Democratic Republic of the Congo, where the elevation is around 975 m (3,200 ft). On average, this region receives 158 lightning strikes per 1 square kilometer (0.39 sq mi) per year. Lake Maracaibo in Venezuela averages 297 days per year with lightning activity. Other lightning hotspots include Catatumbo in Venezuela, Singapore, and Lightning Alley in Central Florida. In order for an electrostatic discharge to occur, two preconditions are necessary: firstly, a sufficiently high potential difference between two regions of space must exist, and secondly, a high-resistance medium must obstruct the free, unimpeded equalization of the opposite charges. The atmosphere provides the electrical insulation, or barrier, that prevents free equalization between charged regions of opposite polarity. It is well understood that during a thunderstorm there is charge separation and aggregation in certain regions of the cloud; however the exact processes by which this occurs are not fully understood. In a process not well understood, a bidirectional channel of ionized air, called a "leader", is initiated between oppositely-charged regions in a thundercloud. Leaders are electrically conductive channels of ionized gas that propagate through, or are otherwise attracted to, regions with a charge opposite of that of the leader tip. The negative end of the bidirectional leader fills a positive charge region, also called a well, inside the cloud while the positive end fills a negative charge well. Leaders often split, forming branches in a tree-like pattern. In addition, negative and some positive leaders travel in a discontinuous fashion, in a process called "stepping". The resulting jerky movement of the leaders can be readily observed in slow-motion videos of lightning flashes. It is possible for one end of the leader to fill the oppositely-charged well entirely while the other end is still active. When this happens, the leader end which filled the well may propagate outside of the thundercloud and result in either a cloud-to-air flash or a cloud-to-ground flash. In a typical cloud-to-ground flash, a bidirectional leader initiates between the main negative and lower positive charge regions in a thundercloud. The weaker positive charge region is filled quickly by the negative leader which then propagates toward the inductively-charged ground. The positively and negatively charged leaders proceed in opposite directions, positive upwards within the cloud and negative towards the earth. Both ionic channels proceed, in their respective directions, in a number of successive spurts. Each leader "pools" ions at the leading tips, shooting out one or more new leaders, momentarily pooling again to concentrate charged ions, then shooting out another leader. The negative leader continues to propagate and split as it heads downward, often speeding up as it get closer to the Earth's surface. About 90% of ionic channel lengths between "pools" are approximately 45 m (148 ft) in length. The establishment of the ionic channel takes a comparatively long amount of time (hundreds of milliseconds) in comparison to the resulting discharge, which occurs within a few dozen microseconds. The electric current needed to establish the channel, measured in the tens or hundreds of amperes, is dwarfed by subsequent currents during the actual discharge. Initiation of the lightning leaders is not well understood. The electric field strength within the thundercloud is not typically large enough to initiate this process by itself. Many hypotheses have been proposed. One theory postulates that showers of relativistic electrons are created by cosmic rays and are then accelerated to higher velocities via a process called runaway breakdown. As these relativistic electrons collide and ionize neutral air molecules, they initiate leader formation. Another theory invokes locally enhanced electric fields being formed near elongated water droplets or ice crystals. Percolation theory, especially for the case of biased percolation,[clarification needed] describes random connectivity phenomena, which produce an evolution of connected structures similar to that of lightning strikes. Once a downward leader connects to an available upward leader, a process referred to as attachment, a low-resistance path is formed and discharge may occur. Photographs have been taken in which unattached streamers are clearly visible. The unattached downward leaders are also visible in branched lightning, none of which are connected to the earth, although it may appear they are. High-speed videos can show the attachment process in progress. Once a conductive channel bridges the air gap between the negative charge excess in the cloud and the positive surface charge excess below, there is a large drop in resistance across the lightning channel. Electrons accelerate rapidly as a result in a zone beginning at the point of attachment, which expands across the entire leader network at a fraction of the speed of light. This is the 'return stroke' and it is the most luminous and noticeable part of the lightning discharge. A large electric current flows along the plasma channel from the cloud to the ground, neutralising the positive ground charge as electrons flow away from the strike point to the surrounding area. This huge surge of current creates large radial voltage differences along the surface of the ground. Called step potentials, they are responsible for more injuries and deaths than the strike itself. Electricity takes every path available to it. A portion of the return stroke current will often preferentially flow through one leg and out another, electrocuting an unlucky human or animal standing near the point where the lightning strikes. The electric current of the return stroke averages 30 kiloamperes for a typical negative CG flash, often referred to as "negative CG" lightning. In some cases, a ground to cloud (GC) lightning flash may originate from a positively charged region on the ground below a storm. These discharges normally originate from the tops of very tall structures, such as communications antennas. The rate at which the return stroke current travels has been found to be around 100,000 km/s. The massive flow of electric current occurring during the return stroke combined with the rate at which it occurs (measured in microseconds) rapidly superheats the completed leader channel, forming a highly electrically conductive plasma channel. The core temperature of the plasma during the return stroke may exceed 50,000 K, causing it to brilliantly radiate with a blue-white color. Once the electric current stops flowing, the channel cools and dissipates over tens or hundreds of milliseconds, often disappearing as fragmented patches of glowing gas. The nearly instantaneous heating during the return stroke causes the air to expand explosively, producing a powerful shock wave which is heard as thunder. To understand why multiple return strokes utilize the same lightning channel, one needs to understand the behavior of positive leaders, which a typical ground flash effectively becomes following the negative leader's connection with the ground. Positive leaders decay more rapidly than negative leaders do. For reasons not well understood, bidirectional leaders tend to initiate on the tips of the decayed positive leaders in which the negative end attempts to re-ionize the leader network. These leaders, also called recoil leaders, usually decay shortly after their formation. When they do manage to make contact with a conductive portion of the main leader network, a return stroke-like process occurs and a dart leader travels across all or a portion of the length of the original leader. The dart leaders making connections with the ground is what causes a majority of subsequent return strokes. Since recoil and dart leader processes do not occur on negative leaders, subsequent return strokes very seldom utilize the same channel on positive ground flashes which are explained later in the article. The electric current within a typical negative CG lightning discharge rises very quickly to its peak value in 1–10 microseconds, then decays more slowly over 50–200 microseconds. The transient nature of the current within a lightning flash results in several phenomena that need to be addressed in the effective protection of ground-based structures. Rapidly changing currents tend to travel on the surface of a conductor, in what is called the skin effect, unlike direct currents, which "flow-through" the entire conductor like water through a hose. Hence, conductors used in the protection of facilities tend to be multi-stranded, with small wires woven together. This increases the total bundle surface area in inverse proportion to the individual strand radius, for a fixed total cross-sectional area. The rapidly changing currents also create electromagnetic pulses (EMPs) that radiate outward from the ionic channel. This is a characteristic of all electrical discharges. The radiated pulses rapidly weaken as their distance from the origin increases. However, if they pass over conductive elements such as power lines, communication lines, or metallic pipes, they may induce a current which travels outward to its termination. This is the "surge" that, more often than not, results in the destruction of delicate electronics, electrical appliances, or electric motors. Devices known as surge protectors (SPD) or transient voltage surge suppressors (TVSS) attached in parallel with these lines can detect the lightning flash's transient irregular current, and, through alteration of its physical properties, route the spike to an attached earthing ground, thereby protecting the equipment from damage. There are three primary types of lightning, defined by what is at the "ends" of a flash channel. There are variations of each type, such as "positive" versus "negative" CG flashes, that have different physical characteristics common to each which can be measured. Different common names used to describe a particular lightning event may be attributed to the same or different events. Cloud-to-ground (CG) lightning is a lightning discharge between a thundercloud and the ground. It is initiated by a stepped leader moving down from the cloud, which is met by a streamer moving up from the ground. CG is the least common, but best understood of all types of lightning. It is easier to study scientifically, because it terminates on a physical object, namely the Earth, and lends itself to being measured by instruments on the ground. Of the three primary types of lightning, it poses the greatest threat to life and property since it terminates or "strikes" the Earth. The overall discharge, termed a flash, is composed of a number of processes such as preliminary breakdown, stepped leaders, connecting leaders, return strokes, dart leaders and subsequent return strokes. Cloud-to-ground (CG) lightning is either positive or negative, as defined by the direction of the conventional electric current from cloud to ground. Most CG lightning is negative, meaning that a negative charge is transferred to ground and electrons travel downward along the lightning channel. The reverse happens in a positive CG flash, where electrons travel upward along the lightning channel and a positive charge is transferred to the ground. Positive lightning is less common than negative lightning, and on average makes up less than 5% of all lightning strikes. A Bolt from the blue lightning strike which appears to initiate from the clear, but turbulent sky above the anvil cloud and drive a bolt of plasma through the cloud directly to the ground. They are commonly referred to as positive flashes despite the fact that they are usually negative in polarity. There are six different mechanisms theorized to result in the formation of downward positive lightning. Vertical wind shear displacing the upper positive charge region of a thundercloud, exposing it to the ground below. The loss of lower charge regions in the dissipating stage of a thunderstorm, leaving the primary positive charge region. A complex arrangement of charge regions in a thundercloud, effectively resulting in an inverted dipole or inverted tripole in which the main negative charge region is above the main positive charge region instead of beneath it. An unusually large lower positive charge region in the thundercloud. Cutoff of an extended negative leader from its origin which creates a new bidirectional leader in which the positive end strikes the ground, commonly seen in anvil-crawler spider flashes. The initiation of a downward positive branch from an intracloud lightning flash. Contrary to popular belief, positive lightning flashes do not necessarily originate from the anvil or the upper positive charge region and strike a rain-free area outside of the thunderstorm. This belief is based on the outdated idea that lightning leaders are unipolar in nature and originating from their respective charge region. Positive lightning strikes tend to be much more intense than their negative counterparts. An average bolt of negative lightning carries an electric current of 30,000 amperes (30 kA), and transfers 15 coulombs of electric charge and 500 megajoules of energy. Large bolts of negative lightning can carry up to 120 kA and 350 coulombs. The average positive ground flash has roughly double the peak current of a typical negative flash, and can produce peak currents up to 400,000 amperes (400 kA) and charges of several hundred coulombs. Furthermore, positive ground flashes with high peak currents are commonly followed by long continuing currents, a correlation not seen in negative ground flashes. As a result of their greater power, as well as lack of warning, positive lightning strikes are considerably more dangerous. Due to the aforementioned tendency for positive ground flashes to produce both high peak currents and long continuing current, they are capable of heating surfaces to much higher levels which increases the likelihood of a fire being ignited. Positive lightning has also been shown to trigger the occurrence of upward lightning flashes from the tops of tall structures and is largely responsible for the initiation of sprites several tens of kilometers above ground level. Positive lightning tends to occur more frequently in winter storms, as with thundersnow, during intense tornadoes and in the dissipation stage of a thunderstorm. Huge quantities of extremely low frequency (ELF) and very low frequency (VLF) radio waves are also generated. A unique form of cloud-to-ground lightning exists where lightning appears to exit from the cumulonimbus cloud and propagate a considerable distance through clear air before veering towards, and striking, the ground. For this reason, they are known as "bolts from the blue". Despite the popular misconception that these are positive lightning strikes due to them seemingly originating from the positive charge region, observations have shown that these are in fact negative flashes. They begin as intracloud flashes within the cloud, the negative leader then exits the cloud from the positive charge region before propagating through clear air and striking the ground some distance away. Intra-cloud lightning most commonly occurs between the upper anvil portion and lower reaches of a given thunderstorm. This lightning can sometimes be observed at great distances at night as so-called "sheet lightning". In such instances, the observer may see only a flash of light without hearing any thunder. Anvil crawler lightning, sometimes called Spider lightning is created when leaders propagate through horizontally-extensive charge regions in mature thunderstorms, usually the stratiform regions of mesoscale convective systems. These discharges usually begin as intracloud discharges originating within the convective region; the negative leader end then propagates well into the aforementioned charge regions in the stratiform area. If the leader becomes too long, it may separate into multiple bidirectional leaders. When this happens, the positive end of the separated leader may strike the ground as a positive CG flash or crawl on the underside of the cloud, creating a spectacular display of lightning crawling across the sky. Ground flashes produced in this manner tend to transfer high amounts of charge, and this can trigger upward lightning flashes and upper-atmospheric lightning. Ball lightning may be an atmospheric electrical phenomenon, the physical nature of which is still controversial. The term refers to reports of luminous, usually spherical objects which vary from pea-sized to several meters in diameter. It is sometimes associated with thunderstorms, but unlike lightning flashes, which last only a fraction of a second, ball lightning reportedly lasts many seconds. Ball lightning has been described by eyewitnesses but rarely recorded by meteorologists. Scientific data on natural ball lightning is scarce owing to its infrequency and unpredictability. The presumption of its existence is based on reported public sightings, and has therefore produced somewhat inconsistent findings. Brett Porter, a wildlife ranger, reported taking a photo at Queensland of Australia in 1987. Cloud-to-air lightning is a lightning flash in which one end of a bidirectional leader exits the cloud, but does not result in a ground flash. Such flashes can sometimes be thought of as failed ground flashes. Blue jets and gigantic jets are a form of cloud-to-air or cloud-to-ionosphere lightning where a leader is launched from the top of a thunderstorm. Smooth channel lightning is an informal term referring to a type of cloud-to-ground lightning strike that has no visible branching and appears like a line with smooth curves as opposed to the jagged appearance of most lightning channels. They are a form of positive lightning generally observed in or near the convective regions of severe thunderstorms in the north central United States. It is theorized that severe thunderstorms in this region obtain an "inverted tripole" charge structure in which the main positive charge region is located below the main negative charge region instead of above it, and as a result these thunderstorms generate predominantly positive cloud-to-ground lightning. The term "smooth channel lightning" is also sometimes attributed to upward ground-to-cloud lightning flashes, which are generally negative flashes initiated by upward positive leaders from tall structures. Upward lightning or ground-to-cloud lightning is a lightning flash which originates from the top of a grounded object and propagates upward from this point. This type of lightning can be triggered by a preceding lightning flash, or it may initiate entirely on its own. The former is generally found in regions where spider lightning occurs, and may involve multiple grounded objects simultaneously. The latter usually occurs during the cold season and may be the dominant lightning type in thundersnow events. Clear-air lightning describes lightning that occurs with no apparent cloud close enough to have produced it. In the U.S. and Canadian Rockies, a thunderstorm can be in an adjacent valley and not observable from the valley where the lightning bolt strikes, either visually or audibly. European and Asian mountainous areas experience similar events. Also in areas such as sounds, large lakes or open plains, when the storm cell is on the near horizon (within 26 km (16 mi)) there may be some distant activity, a strike can occur and as the storm is so far away, the strike is referred to as a bolt from the blue. These flashes usually begin as normal intracloud lightning flashes before the negative leader exits the cloud and strikes the ground a considerable distance away. Positive clear-air strikes can occur in highly sheared environments where the upper positive charge region becomes horizontally displaced from the precipitation area. Objects struck by lightning experience heat and magnetic forces of great magnitude. The heat created by lightning currents traveling through a tree may vaporize its sap, causing a steam explosion that bursts the trunk. As lightning travels through sandy soil, the soil surrounding the plasma channel may melt, forming tubular structures called fulgurites. Although 90 percent of people struck by lightning survive, humans or animals struck by lightning may suffer severe injury due to internal organ and nervous system damage. Buildings or tall structures hit by lightning may be damaged as the lightning seeks unintended paths to ground. By safely conducting a lightning strike to ground, a lightning protection system can greatly reduce the probability of severe property damage. Lightning also serves an important role in the nitrogen cycle by oxidizing diatomic nitrogen in the air into nitrates which are deposited by rain and can fertilize the growth of plants and other organisms. Light travels at about 300,000,000 m/s, and sound travels through air at about 343 m/s. 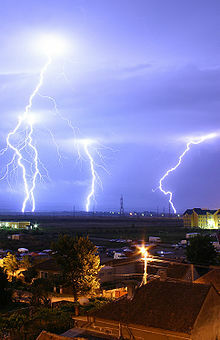 An observer can approximate the distance to the strike by timing the interval between the visible lightning and the audible thunder it generates. A lightning flash preceding its thunder by one second would be approximately 343 m (0.213 mi) in distance; a delay of three seconds would indicate a distance of about one kilometer (0.62 mi) (3×343 m). A flash preceding thunder by five seconds would indicate a distance of approximately one mile (1.6 km) (5×343 m). Consequently, a lightning strike observed at a very close distance will be accompanied by a sudden clap of thunder, with almost no perceptible time lapse, possibly accompanied by the smell of ozone (O3). Lightning at a sufficient distance may be seen and not heard; there is data that a lightning storm can be seen at over 100 miles whereas the thunder travels about 20 miles. Anecdotally, there are many examples of people saying 'the storm was directly overhead or all-around and yet there was no thunder'. There is no coherent data available. A number of observations by space-based telescopes have revealed even higher energy gamma ray emissions, the so-called terrestrial gamma-ray flashes (TGFs). These observations pose a challenge to current theories of lightning, especially with the recent discovery of the clear signatures of antimatter produced in lightning. Recent research has shown that secondary species, produced by these TGFs, such as electrons, positrons, neutrons or protons, can gain energies of up to several tens of MeV. The very high temperatures generated by lightning lead to significant local increases in ozone and oxides of nitrogen. Each lightning flash in temperate and sub-tropical areas produces 7 kg of NOx on average. In the troposphere the effect of lightning can increase NOx by 90% and ozone by 30%. Volcanic activity produces lightning-friendly conditions in multiple ways. The enormous quantity of pulverized material and gases explosively ejected into the atmosphere creates a dense plume of particles. The ash density and constant motion within the volcanic plume produces charge by frictional interactions (triboelectrification), resulting in very powerful and very frequent flashes as the cloud attempts to neutralize itself. Due to the extensive solid material (ash) content, unlike the water rich charge generating zones of a normal thundercloud, it is often called a dirty thunderstorm. Lightning has been observed within the atmospheres of other planets, such as Jupiter and Saturn. Although in the minority on Earth, superbolts appear to be common on Jupiter. Lightning on Venus has been a controversial subject after decades of study. During the Soviet Venera and U.S. Pioneer missions of the 1970s and 1980s, signals suggesting lightning may be present in the upper atmosphere were detected. Although the Cassini–Huygens mission fly-by of Venus in 1999 detected no signs of lightning, the observation window lasted mere hours. Radio pulses recorded by the spacecraft Venus Express (which began orbiting Venus in April 2006) may originate from lightning on Venus. When the local electric field exceeds the dielectric strength of damp air (about 3 million volts per meter), electrical discharge results in a strike, often followed by commensurate discharges branching from the same path. (See image, right.) Mechanisms that cause the charges to build up to lightning are still a matter of scientific investigation. New study confirming dielectric breakdown is involved. Rison 2016. Lightning may be caused by the circulation of warm moisture-filled air through electric fields. Ice or water particles then accumulate charge as in a Van de Graaff generator. The Earth-ionosphere waveguide traps electromagnetic VLF- and ELF waves. Electromagnetic pulses transmitted by lightning strikes propagate within that waveguide. The waveguide is dispersive, which means that their group velocity depends on frequency. The difference of the group time delay of a lightning pulse at adjacent frequencies is proportional to the distance between transmitter and receiver. Together with direction finding methods, this allows locating lightning strikes up to distances of 10,000 km from their origin. Moreover, the eigenfrequencies of the Earth-ionospheric waveguide, the Schumann resonances at about 7.5 Hz, are used to determine the global thunderstorm activity. Research at the University of Innsbruck has found that magnetic fields generated by plasma may induce hallucinations in subjects located within 200 meters of a severe lightning storm. Some high energy cosmic rays produced by supernovas as well as solar particles from the solar wind, enter the atmosphere and electrify the air, which may create pathways for lightning bolts. In French and Italian, the expression for "Love at first sight" is coup de foudre and colpo di fulmine, respectively, which literally translated means "lightning strike". Some European languages have a separate word for lightning which strikes the ground (as opposed to lightning in general); often it is a cognate of the English word "rays". The name of Australia's most celebrated thoroughbred horse, Phar Lap, derives from the shared Zhuang and Thai word for lightning. ^ a b c d "NWS Lightning Safety: Understanding Lightning: Thunderstorm Electrification". National Oceanic and Atmospheric Administration. Archived from the original on November 30, 2016. Retrieved November 25, 2016. This article incorporates text from this source, which is in the public domain. ^ Uman (1986) p. 81. ^ Uman (1986) p. 55. ^ Füllekrug, Martin; Mareev, Eugene A.; Rycroft, Michael J. (May 1, 2006). Sprites, Elves and Intense Lightning Discharges. Springer Science & Business Media. ISBN 9781402046285. Archived from the original on November 4, 2017. ^ New Lightning Type Found Over Volcano? Archived February 9, 2010, at the Wayback Machine. News.nationalgeographic.com (February 2010). Retrieved on June 23, 2012. ^ "Bench collapse sparks lightning, roiling clouds". Volcano Watch. United States Geological Survey. June 11, 1998. Archived from the original on January 14, 2012. Retrieved October 7, 2012. ^ Pardo-Rodriguez, Lumari (Summer 2009) Lightning Activity in Atlantic Tropical Cyclones: Using the Long-Range Lightning Detection Network (LLDN) Archived March 9, 2013, at the Wayback Machine. MA Climate and Society, Columbia University Significant Opportunities in Atmospheric Research and Science Program. ^ Hurricane Lightning Archived August 15, 2017, at the Wayback Machine, NASA, January 9, 2006. ^ Oliver, John E. (2005). Encyclopedia of World Climatology. National Oceanic and Atmospheric Administration. ISBN 978-1-4020-3264-6. Retrieved February 8, 2009. ^ "Lightning". gsu.edu. Archived from the original on January 15, 2016. Retrieved December 30, 2015. ^ Holton, James R.; Curry, Judith A.; Pyle, J. A. (2003). Encyclopedia of atmospheric sciences. Academic Press. ISBN 9780122270901. Archived from the original on November 4, 2017. ^ "Where LightningStrikes". NASA Science. Science News. December 5, 2001. Archived from the original on July 16, 2010. Retrieved July 5, 2010. ^ Uman (1986) Ch. 8, p. 68. ^ "Kifuka – place where lightning strikes most often". Wondermondo. November 7, 2010. Archived from the original on October 1, 2011. Retrieved November 21, 2010. ^ "Annual Lightning Flash Rate". National Oceanic and Atmospheric Administration. Archived from the original on March 30, 2008. Retrieved February 8, 2009. ^ "Lightning Activity in Singapore". National Environmental Agency. 2002. Archived from the original on September 27, 2007. Retrieved September 24, 2007. ^ "Staying Safe in Lightning Alley". NASA. January 3, 2007. Archived from the original on July 13, 2007. Retrieved September 24, 2007. ^ Pierce, Kevin (2000). "Summer Lightning Ahead". Florida Environment.com. Archived from the original on October 12, 2007. Retrieved September 24, 2007. ^ Saunders, C. P. R. (1993). "A Review of Thunderstorm Electrification Processes". Journal of Applied Meteorology. 32 (4): 642–55. Bibcode:1993JApMe..32..642S. doi:10.1175/1520-0450(1993)032<0642:AROTEP>2.0.CO;2. ^ Goulde, R.H. (1977) "The lightning conductor", pp. 545–576 in Lightning Protection, R.H. Golde, Ed., Lightning, Vol. 2, Academic Press. ^ Stolzenburg, Maribeth; Marshall, Thomas C. (2008). "Charge Structure and Dynamics in Thunderstorms". Space Science Reviews. 137 (1–4): 355. Bibcode:2008SSRv..137..355S. doi:10.1007/s11214-008-9338-z. ^ Petersen, Danyal; Bailey, Matthew; Beasley, William H.; Hallett, John (2008). "A brief review of the problem of lightning initiation and a hypothesis of initial lightning leader formation". Journal of Geophysical Research. 113 (D17): D17205. Bibcode:2008JGRD..11317205P. doi:10.1029/2007JD009036. ^ Hooyberghs, Hans; Van Schaeybroeck, Bert; Moreira, André A.; Andrade, José S.; Herrmann, Hans J.; Indekeu, Joseph O. (2010). "Biased percolation on scale-free networks". Physical Review E. 81 (1): 011102. arXiv:0908.3786. Bibcode:2010PhRvE..81a1102H. doi:10.1103/PhysRevE.81.011102. PMID 20365318. ^ Kasemir, H. W. (1950) "Qualitative Übersicht über Potential-, Feld- und Ladungsverhaltnisse bei einer Blitzentladung in der Gewitterwolke" (Qualitative survey of the potential, field and charge conditions during a lightning discharge in the thunderstorm cloud) in Das Gewitter (The Thunderstorm), H. Israel, ed., Leipzig, Germany: Akademische Verlagsgesellschaft. ^ "The Path of Least Resistance". July 2001. Archived from the original on January 4, 2016. ^ Idone, V. P.; Orville, R. E.; Mach, D. M.; Rust, W. D. (1987). "The propagation speed of a positive lightning return stroke". Geophysical Research Letters. 14 (11): 1150. Bibcode:1987GeoRL..14.1150I. doi:10.1029/GL014i011p01150. ^ Uman (1986) Ch. 5, p. 41. ^ Uman (1986) pp. 103–110. ^ a b c Warner, Tom (May 6, 2017). "Ground Flashes". ZT Research. Retrieved November 9, 2017. ^ Uman (1986) Ch. 9, p. 78. ^ "NWS JetStream – The Positive and Negative Side of Lightning". National Oceanic and Atmospheric Administration. Archived from the original on July 5, 2007. Retrieved September 25, 2007. ^ Nag, Amitabh; Rakov, Vladimir A (2012). "Positive lightning: An overview, new observations, and inferences". Journal of Geophysical Research: Atmospheres. 117 (D8): n/a. Bibcode:2012JGRD..117.8109N. doi:10.1029/2012JD017545. ^ Hasbrouck, Richard. Mitigating Lightning Hazards Archived October 5, 2013, at the Wayback Machine, Science & Technology Review May 1996. Retrieved on April 26, 2009. ^ U.A.Bakshi; M.V.Bakshi (January 1, 2009). Power System – II. Technical Publications. p. 12. ISBN 978-81-8431-536-3. Archived from the original on March 12, 2017. ^ Saba, Marcelo M. F; Schulz, Wolfgang; Warner, Tom A; Campos, Leandro Z. S; Schumann, Carina; Krider, E. Philip; Cummins, Kenneth L; Orville, Richard E (2010). "High-speed video observations of positive lightning flashes to ground". Journal of Geophysical Research: Atmospheres. 115 (D24): D24201. Bibcode:2010JGRD..11524201S. doi:10.1029/2010JD014330. ^ Antony H. Perez; Louis J. Wicker & Richard E. Orville (1997). "Characteristics of Cloud-to-Ground Lightning Associated with Violent Tornadoes". Weather Forecast. 12 (3): 428–37. Bibcode:1997WtFor..12..428P. doi:10.1175/1520-0434(1997)012<0428:COCTGL>2.0.CO;2. ^ a b Christian, Hugh J.; McCook, Melanie A. "A Lightning Primer – Characteristics of a Storm". NASA. Archived from the original on March 5, 2016. Retrieved February 8, 2009. ^ Boccippio, DJ; Williams, ER; Heckman, SJ; Lyons, WA; Baker, IT; Boldi, R (August 1995). "Sprites, ELF Transients, and Positive Ground Strokes". Science. 269 (5227): 1088–1091. Bibcode:1995Sci...269.1088B. doi:10.1126/science.269.5227.1088. PMID 17755531. ^ a b Lu, Gaopeng; Cummer, Steven A; Blakeslee, Richard J; Weiss, Stephanie; Beasley, William H (2012). "Lightning morphology and impulse charge moment change of high peak current negative strokes". Journal of Geophysical Research: Atmospheres. 117 (D4): n/a. Bibcode:2012JGRD..117.4212L. CiteSeerX 10.1.1.308.9842. doi:10.1029/2011JD016890. ^ a b Krehbiel, Paul R; Riousset, Jeremy A; Pasko, Victor P; Thomas, Ronald J; Rison, William; Stanley, Mark A; Edens, Harald E (2008). "Upward electrical discharges from thunderstorms". Nature Geoscience. 1 (4): 233. Bibcode:2008NatGe...1..233K. doi:10.1038/ngeo162. ^ Singer, Stanley (1971). The Nature of Ball Lightning. New York: Plenum Press. ISBN 978-0-306-30494-1. ^ Ball, Philip (January 17, 2014). "Focus:First Spectrum of Ball Lightning". Focus. 7. Archived from the original on January 18, 2014. Retrieved January 18, 2014. ^ Tennakone, Kirthi (2007). "Ball Lightning". Georgia State University. Archived from the original on February 12, 2008. Retrieved September 21, 2007. ^ Porter, Brett (1987). "Brett Porter, Photo in 1987, BBC:Ball lightning baffles scientists, day, 21 December, 2001, 00:26 GMT". Archived from the original on April 20, 2016. ^ Robinson, Dan. "Weather Library: Lightning Types & Classifications". Archived from the original on February 15, 2013. Retrieved March 17, 2013. ^ Haby, Jeff. "What is heat lightning?". theweatherprediction.com. Archived from the original on November 4, 2016. ^ "Lightning Types and Classifications". Archived from the original on October 26, 2017. Retrieved October 26, 2017. ^ "Definition of Rocket Lightning, AMS Glossary of Meteorology". Archived from the original on August 17, 2007. Retrieved July 5, 2007. ^ "Glossary". National Oceanic and Atmospheric Administration. National Weather Service. Archived from the original on September 15, 2008. Retrieved September 2, 2008. ^ Marshall, Tim; David Hoadley (illustrator) (May 1995). Storm Talk. Texas. ^ Turman, B. N. (1977). "Detection of lightning superbolts". Journal of Geophysical Research. 82 (18): 2566–2568. Bibcode:1977JGR....82.2566T. doi:10.1029/JC082i018p02566. ^ "When Lightning Strikes Out of a Blue Sky". DNews. Archived from the original on November 1, 2015. Retrieved October 15, 2015. ^ Lawrence, D (November 1, 2005). "Bolt from the Blue". National Oceanic and Atmospheric Administration. Archived from the original on May 14, 2009. Retrieved August 20, 2009. ^ Jabr, Ferris (September 22, 2014). "Lightning-Strike Survivors Tell Their Stories". Outside. Archived from the original on September 28, 2014. Retrieved September 28, 2014. ^ Bond, D.W.; Steiger, S.; Zhang, R.; Tie, X.; Orville, R.E. (2002). "The importance of NOx production by lightning in the tropics". Atmospheric Environment. 36 (9): 1509–1519. Bibcode:2002AtmEn..36.1509B. doi:10.1016/s1352-2310(01)00553-2. ^ Pickering, K.E., Bucsela, E., Allen, D, Cummings, K., Li, Y., MacGorman, D., Bruning, E. 2014. Estimates of Lightning NOx Production Per Flash from OMI NO2 and Lightning Observations. XV International Conference on Atmospheric Electricity, 15–20, June 2014. ^ Wilson, C.T.R. (1925). "The acceleration of beta-particles in strong electric fields such as those of thunderclouds". Proceedings of the Cambridge Philosophical Society. 22 (4): 534–538. Bibcode:1925PCPS...22..534W. doi:10.1017/S0305004100003236. ^ Moore, C. B.; Eack, K. B.; Aulich, G. D.; Rison, W. (2001). "Energetic radiation associated with lightning stepped-leaders". Geophysical Research Letters. 28 (11): 2141. Bibcode:2001GeoRL..28.2141M. doi:10.1029/2001GL013140. ^ Dwyer, J. R.; Uman, M. A.; Rassoul, H. K.; Al-Dayeh, M.; Caraway, L.; Jerauld, J.; Rakov, V. A.; Jordan, D. M.; Rambo, K. J.; Corbin, V.; Wright, B. (2003). "Energetic Radiation Produced During Rocket-Triggered Lightning" (PDF). Science. 299 (5607): 694–697. Bibcode:2003Sci...299..694D. doi:10.1126/science.1078940. PMID 12560549. Archived (PDF) from the original on March 4, 2016. ^ Newitz, A. (September 2007) "Educated Destruction 101", Popular Science, p. 61. ^ Scientists close in on source of X-rays in lightning Archived September 5, 2008, at the Wayback Machine, Physorg.com, July 15, 2008. Retrieved July 2008. ^ Prostak, Sergio (April 11, 2013). "Scientists Explain Invisible 'Dark Lightning'". Sci-News.com. Archived from the original on June 20, 2013. Retrieved July 9, 2013. ^ Signature Of Antimatter Detected In Lightning – Science News Archived July 16, 2012, at the Wayback Machine. Sciencenews.org (December 5, 2009). Retrieved on June 23, 2012. ^ Köhn, C.; Ebert, U. (2015). "Calculation of beams of positrons, neutrons and protons associated with terrestrial gamma-ray flashes". J. Geophys. Res. Atmospheres. 23 (4): 1620–1635. Bibcode:2015JGRD..120.1620K. doi:10.1002/2014JD022229. ^ Köhn, C.; Diniz, G.; Harakeh, Muhsin (2017). "Production mechanisms of leptons, photons, and hadrons and their possible feedback close to lightning leaders". J. Geophys. Res. Atmospheres. 122 (2): 1365–1383. Bibcode:2017JGRD..122.1365K. doi:10.1002/2016JD025445. PMC 5349290. PMID 28357174. ^ "Lightning's 'NOx-ious' Impact On Pollution, Climate". Science News. Retrieved August 4, 2018. ^ "Surprise! Lightning has big effect on atmospheric chemistry". NASA. Retrieved August 4, 2018. ^ Pliny the Younger. "Pliny the Younger's Observations". Archived from the original on June 25, 2003. Retrieved July 5, 2007. Behind us were frightening dark clouds, rent by lightning twisted and hurled, opening to reveal huge figures of flame. ^ Dell'Amore, Christine (February 3, 2010) New Lightning Type Found Over Volcano? Archived October 20, 2012, at the Wayback Machine. National Geographic News. ^ Strangeway, Robert J. (1995). "Plasma Wave Evidence for Lightning on Venus". Journal of Atmospheric and Terrestrial Physics. 57 (5): 537–556. Bibcode:1995JATP...57..537S. doi:10.1016/0021-9169(94)00080-8. Archived from the original on October 12, 2007. Retrieved September 24, 2007. ^ Uman (1986) Ch. 4, pp. 26–34. ^ Colvin, J. D.; Mitchell, C. K.; Greig, J. R.; Murphy, D. P.; Pechacek, R. E.; Raleigh, M. (1987). "An empirical study of the nuclear explosion-induced lightning seen on IVY-MIKE". Journal of Geophysical Research. 92 (D5): 5696–5712. Bibcode:1987JGR....92.5696C. doi:10.1029/JD092iD05p05696. ^ Fink, Micah. "How Lightning Forms". PBS.org. Public Broadcasting System. Archived from the original on September 29, 2007. Retrieved September 21, 2007. ^ National Weather Service (2007). "Lightning Safety". National Weather Service. Archived from the original on October 7, 2007. Retrieved September 21, 2007. ^ Uman (1986) p. 61. ^ Rakov and Uman, p. 84. ^ Thomson, E. M.; Uman, M. A.; Beasley, W. H. (January 1985). "Speed and current for lightning stepped leaders near ground as determined from electric field records". Journal of Geophysical Research. 90 (D5): 8136. Bibcode:1985JGR....90.8136T. doi:10.1029/JD090iD05p08136. ^ The Franklin Institute. Ben Franklin's Lightning Bells Archived December 12, 2008, at the Wayback Machine. Retrieved December 14, 2008. ^ "Vaisala Thunderstorm Online Application Portal". Archived from the original on September 28, 2007. Retrieved July 27, 2007. Real-time map of lightning discharges in U.S.
^ Volland, H. (ed) (1995) Handbook of Atmospheric Electrodynamics, CRC Press, Boca Raton, ISBN 0849386470. ^ "NASA Dataset Information". NASA. 2007. Archived from the original on September 15, 2007. Retrieved September 11, 2007. ^ "NASA LIS Images". NASA. 2007. Archived from the original on October 12, 2007. Retrieved September 11, 2007. ^ "NASA OTD Images". NASA. 2007. Archived from the original on October 12, 2007. Retrieved September 11, 2007. ^ Kridler, Chris (July 25, 2002). "Triggered lightning video" (video). requires QuickTime. Chris Kridler's Sky Diary. Archived from the original on September 15, 2007. Retrieved September 24, 2007. ^ Koopman, David W. & Wilkerson, T. D. (1971). "Channeling of an Ionizing Electrical Streamer by a Laser Beam". Journal of Applied Physics. 42 (5): 1883–1886. Bibcode:1971JAP....42.1883K. doi:10.1063/1.1660462. ^ Saum, K. A. & Koopman, David W. (November 1972). "Discharges Guided by Laser-Induced Rarefaction Channels". Physics of Fluids. 15 (11): 2077–2079. Bibcode:1972PhFl...15.2077S. doi:10.1063/1.1693833. ^ Schubert, C. W. (1977). "The laser lightning rod: A feasibility study". Technical Report AFFDL-TR-78-60, ADA063847, [U.S.] Air Force Flight Dynamics Laboratory, Wright-Patterson AFB [Air Force Base] Ohio. Archived from the original on December 24, 2008. Retrieved December 13, 2018. ^ Lippert, J. R. (1977). "A laser-induced lightning concept experiment". Final Report. Bibcode:1978affd.rept.....L.
^ Rakov and Uman, pp. 296–299. ^ "UNM researchers use lasers to guide lightning". Campus News, The University of New Mexico. January 29, 2001. Archived from the original on July 9, 2012. Retrieved July 28, 2007. ^ Khan, N.; Mariun, N.; Aris, I.; Yeak, J. (2002). "Laser-triggered lightning discharge". New Journal of Physics. 4 (1): 61. Bibcode:2002NJPh....4...61K. doi:10.1088/1367-2630/4/1/361. ^ Rambo, P.; Biegert, J.; Kubecek, V.; Schwarz, J.; Bernstein, A.; Diels, J.-C.; Bernstein, R. & Stahlkopf, K. (1999). "Laboratory tests of laser-induced lightning discharge". Journal of Optical Technology. 66 (3): 194–198. doi:10.1364/JOT.66.000194. ^ Ackermann, R.; Stelmaszczyk, K.; Rohwetter, P.; MéJean, G.; Salmon, E.; Yu, J.; Kasparian, J.; MéChain, G.; Bergmann, V.; Schaper, S.; Weise, B.; Kumm, T.; Rethmeier, K.; Kalkner, W.; WöSte, L.; Wolf, J. P. (2004). "Triggering and guiding of megavolt discharges by laser-induced filaments under rain conditions". Applied Physics Letters. 85 (23): 5781. Bibcode:2004ApPhL..85.5781A. doi:10.1063/1.1829165. ^ Wang, D.; Ushio, T.; Kawasaki, Z. -I.; Matsuura, K.; Shimada, Y.; Uchida, S.; Yamanaka, C.; Izawa, Y.; Sonoi, Y.; Simokura, N. (1995). "A possible way to trigger lightning using a laser". Journal of Atmospheric and Terrestrial Physics. 57 (5): 459. Bibcode:1995JATP...57..459W. doi:10.1016/0021-9169(94)00073-W.
^ "Terawatt Laser Beam Shot in the Clouds Provokes Lightning Strike". Archived from the original on April 20, 2008. News report based on: Kasparian, J.; Ackermann, R.; André, Y. B.; Méchain, G. G.; Méjean, G.; Prade, B.; Rohwetter, P.; Salmon, E.; Stelmaszczyk, K.; Yu, J.; Mysyrowicz, A.; Sauerbrey, R.; Woeste, L.; Wolf, J. P. (2008). "Electric events synchronized with laser filaments in thunderclouds". Optics Express. 16 (8): 5757–63. Bibcode:2008OExpr..16.5757K. doi:10.1364/OE.16.005757. PMID 18542684. ^ Graham, K.W.T. (1961). "The Re-magnetization of a Surface Outcrop by Lightning Currents". Geophysical Journal International. 6 (1): 85. Bibcode:1961GeoJ....6...85G. doi:10.1111/j.1365-246X.1961.tb02963.x. ^ Cox A. (1961). Anomalous Remanent Magnetization of Basalt Archived May 29, 2013, at the Wayback Machine. U.S. Geological Survey Bulletin 1038-E, pp. 131–160. ^ Bevan B. (1995). "Magnetic Surveys and Lightning". Near Surface Views (newsletter of the Near Surface Geophysics section of the Society of Exploration Geophysics). October 1995, pp. 7–8. ^ Wasilewski, Peter; Günther Kletetschka (1999). "Lodestone: Nature's only permanent magnet – What it is and how it gets charged" (PDF). Geophysical Research Letters. 26 (15): 2275–78. Bibcode:1999GeoRL..26.2275W. doi:10.1029/1999GL900496. Archived from the original (PDF) on October 3, 2006. Retrieved July 13, 2009. ^ Sakai, H. S.; Sunada, S.; Sakurano, H. (1998). "Study of Lightning Current by Remanent Magnetization". Electrical Engineering in Japan. 123 (4): 41–47. doi:10.1002/(SICI)1520-6416(199806)123:4<41::AID-EEJ6>3.0.CO;2-O. ^ Archaeo-Physics, LLC | Lightning-induced magnetic anomalies on archaeological sites Archived October 12, 2007, at the Wayback Machine. Archaeophysics.com. Retrieved on June 23, 2012. ^ Maki, David (2005). "Lightning strikes and prehistoric ovens: Determining the source of magnetic anomalies using techniques of environmental magnetism" (PDF). Geoarchaeology. 20 (5): 449–459. CiteSeerX 10.1.1.536.5980. doi:10.1002/gea.20059. Archived (PDF) from the original on May 15, 2013. ^ Verrier, V.; Rochette, P. (2002). "Estimating Peak Currents at Ground Lightning Impacts Using Remanent Magnetization". Geophysical Research Letters. 29 (18): 1867. Bibcode:2002GeoRL..29.1867V. doi:10.1029/2002GL015207. ^ "High-speed solar winds increase lightning strikes on Earth". Iop.org. May 15, 2014. Retrieved May 19, 2014. ^ Gomes, Chandima; Gomes, Ashen (2014). "Lightning; Gods and sciences". IEEE Xplore. ieee.org. pp. 1909–1918. doi:10.1109/ICLP.2014.6973441. ISBN 978-1-4799-3544-4. Archived from the original on |archive-url= requires |archive-date= (help). ^ Uman (1986) Ch. 6, p. 47. ^ "Jesus actor struck by lightning". BBC News. October 23, 2003. Archived from the original on September 17, 2007. Retrieved August 19, 2007. ^ Picture of John Kaspar of the National States Rights Party speaking in front of the party’s lightning bolt flag (the flag was red, white, and blue) Archived February 3, 2013, at the Wayback Machine. Mauryk2.com (November 6, 2010). Retrieved on April 9, 2013. ^ "Lightning". Phar Lap: Australia's wonder horse. Museum Victoria. Archived from the original on October 24, 2009. ^ Hillier, Bevis (1968). Art Deco of the 20s and 30s. Studio Vista. Archived from the original on April 26, 2016. Rakov, Vladimir A.; Uman, Martin A. (2003). Lightning: Physics and effects. Cambridge, England: Cambridge University Press. ISBN 978-0521583275. Uman, Martin A. (1986). All About Lightning. Dover Publications, Inc. pp. 103–110. ISBN 978-0-486-25237-7. This article incorporates public domain material from the National Oceanic and Atmospheric Administration document "Understanding Lightning: Thunderstorm Electrification". Alex Larsen (1905). "Photographing Lightning With a Moving Camera". Annual Report Smithsonian Institution. 60 (1): 119–127. André Anders (2003). "Tracking Down the Origin of Arc Plasma Science I. Early Pulsed and Oscillating Discharges". IEEE Transactions on Plasma Science. 31 (4): 1052–1059. Bibcode:2003ITPS...31.1052A. doi:10.1109/TPS.2003.815476. This is also available at Anders, A. (2003). "Energy Citations Database (ECD)" (PDF). IEEE Transactions on Plasma Science. 31 (5): 1052–1059. doi:10.1109/TPS.2003.815476. Retrieved September 5, 2008. Anna Gosline (May 2005). "Thunderbolts from space". New Scientist. 186 (2498): 30–34. Sample, in .PDF form, consisting of the book through page 20. P.R. Field; W.H. Hand; G. Cappelluti; et al. (November 2010). "Hail Threat Standardisation" (PDF). European Aviation Safety Agency. RP EASA.2008/5. Archived from the original (PDF) on December 7, 2013. Cooray, Vernon (2014). An Introduction to Lightning. Springer Verlag. doi:10.1007/978-94-017-8938-7. ISBN 978-94-017-8937-0. "Lightning" . Encyclopædia Britannica. 16 (11th ed.). 1911. p. 673. This page was last edited on 19 April 2019, at 20:25 (UTC).